Long Beach Mayor Robert Garcia joined leaders from the Long Beach Unified School District, Long Beach City College and Cal State Long Beach this week in renewing and expanding the nationally recognized Long Beach College Promise. The College Promise was first signed in 2008 by leaders from LBUSD, LBCC and CSULB to help students prepare for, and succeed in, college. LBUSD graduates can receive a tuition-free semester at LBCC and guaranteed admission to CSULB if they meet minimum requirements at the university. An expansion of the College Promise will focus on universal preschool enrollment and a doubling of internships among local students. Garcia said the City of Long Beach would take the lead by doubling the city’s 400 internships to 800. The internship expansion will help boost the school district’s Linked Learning instruction that ties together classroom time and work-based learning to make coursework more relevant and rigorous. The College Promise expansion also will include efforts to increase student scholarships and other student support. Already, the College Promise has helped achieve a 43 percent increase in CSULB enrollment by LBUSD graduates. More than 5,600 high school graduates have benefited from free enrollment at the city college in the fall semester, and LBCC and LBUSD students have shown that they are more likely to remain enrolled at the university than other students. The mayor joined LBUSD Superintendent Christopher J. Steinhauser, LBCC President Eloy Ortiz Oakley and CSULB President Jane Close Conoley in signing the expanded College Promise document during a ceremony at McBride High School. The officials were joined by students from the school, along with kindergartners from nearby Newcomb Academy. 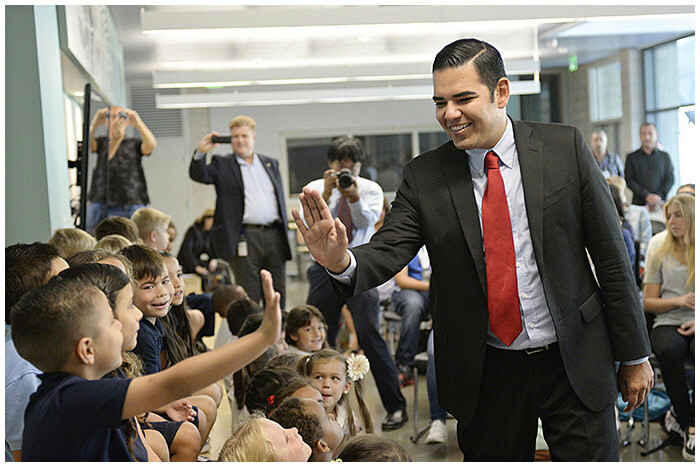 COLLEGE PROMISE – Long Beach Mayor Robert Garcia high fives kindergartners from Newcomb Academy during a signing ceremony for the Long Beach College Promise, a pledge by local education officials and the city to help more students prepare for and succeed in college and careers.